Regardless of the exact flavor or type of smoked salmon you’re after, one thing is always true: doesn’t have to involve a lot of ingredients. High-quality smoked salmon starts with the right fresh ingredients, only the freshest fish sourced from conscientious, sustainable sources, proven smoking methods and ends in a consistently fantastic product. The first step in making smoked salmon is of course sourcing the fish. The only way to create a superior, tasty product is to start with the best ingredients. Supermarket smoked salmon is purchased from farms all over the world and the salmon might not always be raised in the best environments. The water may be too warm, the feed might be adulterated with hormones and colorants, and the salmon might be treated to preservatives and nitrates before shipping. There are also lots of different salmon species offered at the grocery store. Catsmo Artisan Smokehouse takes a different approach to sourcing salmon. We purchase only Atlantic salmon from the right countries at the right times (Scotland in the winter and Chile in the summer) to make sure the salmon is always raised in cold waters, which has a huge effect on both the flavor and the texture. The fish is raised in large, aquaculture farms with plenty of space to keep the fish stress-free and happy. We have direct relationships with the farmers and have visited the locations to check the quality of the natural feed and the aquaculture conditions. Everyday shipments of fresh, ice-packed salmon filets are sent directly from these partner farms to our artisanal smoking facility in the Hudson Valley via plane and then our own refrigerated trucks. Next up: quality control! You can’t make great smoked salmon if you’re not starting with great fish. During the inspection it’s necessary to actually check the salmon visually and by smell. When a shipment arrives, we open up all the boxes and check out the fillets. Less telling than the sense of sight is actually the sense of smell. If there is any hint of a fishy smell then that’s a problem. We don’t accept any shipments with any odors whatsoever. The only scent that passes inspection is one of fresh, clean water—not fish. Immediately after the fish is received and inspected (or should we say smell tested? ), we cure it. Because the curing happens so quickly, the product stays incredibly fresh, and our end-product is never dry or fishy but instead has a fresh, delicate texture and flavor. Depending on the unique recipe of one of our products, or the recipe requested by a restaurant or chef we partner with, there may be a small amount of sugar used during curing but by the end of the process the sugar is dissolved and no longer detectable. Our salmon is treated with nothing but salt, herbs, spices, and natural smoke. On each rack of salmon, we add a little note to make sure we remove the salt at the right time. Next, it’s time to rinse off the salt. Rinsing the salmon to get all of the salt off is a very important because it halts the curing process and ensures that the flavor is not overly salty. After the salmon is rinsed, it is dried on wire racks. At this point, the salmon is already largely preserved from the curing. After a quick drying process, the salmon fillets are loaded into the smoker. Cold smoking, which yields a smooth, silky texture, requires a temperature of less than 90 degrees fahrenheit. Hot smoking, on the other hand, is done at over 120 degrees. Different woods offer different flavors. When fruit wood is used during smoking, for example, the end product is very subtly fragrant. While we sometimes incorporate natural ingredients for high-quality flavor add-ins, our core focus is on preserving and flavoring salmon with salt and woodsmoke only. This allows the quality of the salmon to truly take center stage. After the salmon comes out from the smoker, the black meat and skin is removed. They don’t come off a moment before because the high fat content adds to the overall flavor during the smoking process. Once the black meat and skin is removed, the salmon is either packed up whole or it is sliced. Some of our customers prefer to purchase the salmon side whole and slice it themselves. Chefs want to cut it according to their signature recipes, while delis want to slice it for their customers in the amounts and widths desired. On the other hand, some customers and partners prefer it already sliced and ready to go! 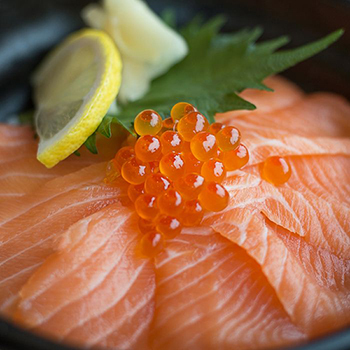 Since the salmon is fully preserved, whether it is sliced or not does not affect its flavor or shelf life. It’s simply a matter of convenience and preference. Whether whole or sliced, the smoked salmon is then vacuum-packaged air tight and stored in the refrigerator. It’s never frozen at our facility so that customers can choose to buy in bulk and freeze if they like. The last step is best—devouring it. The process for smoking salmon is fairly simple, but the devil is in the details. What really results in a delicious end product is using the highest quality salmon and natural woods. Do you have any other questions about the process? Don’t hesitate to ask. We can be reached via email at hello@solexcatsmo.com or via phone at (845) 895-3361.